The power of the Holy Spirit cannot be overestimated. The same Spirit who imbued the Apostles at Pentecost 2000 years ago, is the very same Spirit, who will be invoked by Bishop Loverde at the Cathedral of St. Thomas More as he ordains four men to the Sacred Diaconate next Saturday. It is the same Spirit that pours forth the virtues and the gifts of the Holy Spirit into the soul of every person who is baptized either as an infant or later on in life. And, it is the same Spirit whom the priest invokes at every Mass during the Eucharistic Prayer. The Holy Spirit gives power to our sacraments and makes Jesus present in the Church today as He has from her inception, 2 millennia past. Our first reading today, taken from the Acts of the Apostles, otherwise known as the Gospel of the Holy Spirit, relates those marvelous events of Pentecost, a narrative with which we are all familiar. The Holy Spirit descended upon the Apostles and appeared to them in tongues of fire and they were filled with the Holy Spirit and began to speak in different languages as the Spirit enabled them to proclaim. In an instant, the confusion at the Tower of Babel was replaced with the unity of understanding found in the Spirit. How different the tenor among the Apostles, who, just 53 days prior to this event on the evening of the Last Supper, were a band of confused and scared men who abandoned their Lord and Master in His moment of gravest need and allowed Him to suffer a horrific death. What a difference their new life in the Spirit had made for them. What a difference a life in the Spirit can make for us. 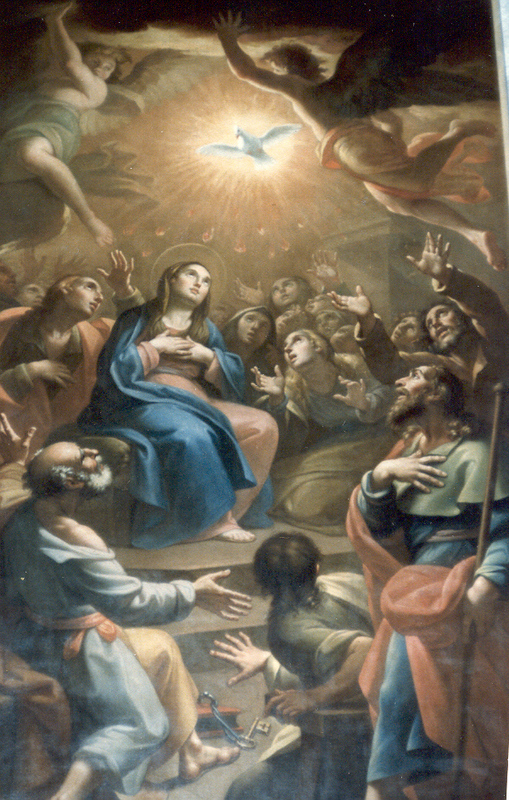 Pentecost marks the end of the Easter Season. Tomorrow, we will return to ordinary time. By the grace of God, let us resolve to live in the Spirit, sanctifying our work and leisure in our day-to-day living. One of the things that the Holy Spirit helps us to do is to pray. The Holy Spirit helps us with the grace of prayer so that we pray as we ought for in Romans, St. Paul states that we do not know how to pray as we ought. It is helpful to know the various ways that prayer is conducted, but even to suggest that there is a method to prayer would be inaccurate because essentially, prayer is a conversation that beings with God, said St. Theresa of Avila. So, there are basically two kinds of prayer: mental prayer, also known as meditation and contemplative prayer. First, there is mental prayer. In mental prayer, the person enters into a conversation with God by applying the mind to spiritual reading and the Scriptures in order to listen and perceive what God is trying to teach us. It's amazing how one can read the same Scripture passage time and time again and yet discover new insights. That's the Holy Spirit working in our souls. St. Ignatius of Loyola would recommend that one mediate on a scene in the Scriptures and use your Catholic imagination to put yourself in the scene to observe how you would react to what you heard or saw. It's a very effective way of listening to how God wants to act in you. Note well that mental prayer has God as the object of our prayer, not oneself. Some years ago, a type of prayer known as centering prayer became very popular. It sought to help a person re-center or rediscover inner balance and God working in them. The problem with centering prayer, of course, is that the person praying in this way turns too inward and spends their time looking at themselves and not God. The human person becomes the object of prayer - not God. This is the danger in centering prayer - one can end up praying to oneself, setting oneself up as God. 2. Contrition - a prayer of profound sorrow for one's sins and a desire to reform one's life. When one gazes upon God, one should see one's inadequacies, faults, sins and flaws that only God can truly heal and reform. Contrition should also elicit great hope (trust) that God can do this reformation in us. 4. Supplication - this is the prayer that we often altogether do too much. We ask and ask and ask, at the expense of not adoring or thinking or expressing contrition. The irony is that God already knows what we want and what we truly need. We ought to spend less time asking God to give us x or y and spend more time asking Him for the grace to accept whatever He wants to give us - that it be according to His most holy will and for our true good. St. Augustine once said that while it is proper to ask God for things or to meet our needs, we must always do so with a posture of humble acceptance of His will. St. Jose María Escriva used to say that if you really want to give God a good laugh, tell you YOUR plans. Finally, contemplative prayer is a whole category of prayer that relies much less on applying the mind towards God but rather, rests in God - heart to heart (cor ad cor, in Latin). It's the type of prayer that desires to simply be in God's presence - no words need be said, but a prayer that delights in knowledge that God is really present and that we are loved. St. Theresa of Avila used to say that prayer is when we gaze upon the One who looks at us with love. It is in contemplation that the highest spiritual gifts are given: bilocation, locutions, ecstasies, etc. It is the highest form of prayer, outside of Mass and it is the beginning of the soul's experience of a true unity with God in their lives. At first, a person may experience great consolation and warmth in prayer - spiritual "warm fuzzies." After awhile, however, the good feelings seem to diminish. At this point, many persons abandon prayer because they don't feel anything. Actually, what may be happening is that the lack of feeling in prayer may be equated with spiritual deepening. In other words, at first, God gives us great consolation in prayer so that we can return to Him time and time again. Once we have committed to prayer, He can withdraw those feelings from us so that we come to prayer without thought of what we can get out of it but rather - what we can give in prayer. It's more meritorious to pray when you don't feel anything because it means that you are in front of the tabernacle only to give and not receive. It would be a mistake to abandon prayer due to a lack of feeling - feelings are too fickle to serve as reliable guides in the interior life. Praised be Jesus Christ - Now and Forever!